Envirodyne Group (EDG) offers StakSentinelTM a proprietary range of flexible 'Gas Monitoring Systems' which can be configured to satisfy most applications. Both 'Fixed' and 'Portable' units are available, depending on your requirements. EDG’s 'Gas Monitoring Systems' are ideal for when flame proofing of equipment is not economically feasible or where moisture ingress with the gas can cause problems. StakSentinelTM can be solar powered for mqany remote applications where power is unavailable. StakSentinelTM is suitable for the sampling and analysis of air borne pollutants such as 'Gas', 'Vapours' and 'Dust'. For area sources,sampling cones and stainless steel piping are placed in the required area of analysis. For vents sources, sample lines using isokinetic principles are used. Stainless steel tubing is run back to the analyser, may be up to 500m away. Within the analyser is a sample pump which draws the sample from the site being monitored. The analyser box can be mounted in a non hazardous area. The sample flows through the analyser head, which gives an output signal of 4-20mA, or 0-12V, which are proportional to the concentration. The output signal can be viewed on a digital read-out or chart recorders for visual indication of real time analysis. The output signal can also be logged and/or retransmitted via a our GRPS/GSM telemetry system - in real time. StakSentinelTM has many advantages, including ease of installation and servicing. All working parts are in the one box and unlimited zones may be recorded from one analyser box location. The sampling process used in StakSentinelTM can be used for multiple monitoring points in a network arrangement that will eliminate the need for 'Discrete Monitoring Systems'. Contact EDG should there be a situation where multiple applications are involved. The merits of StakSentinelTM and HydroSentinelTM in providing the scope for audit work in validating permits in Carbon Emiussion Trading Markets can be found in the paper: "Live Monitoring of Carbon Emissions for Sustainable International Trade & Exchange" attached in Downloads. 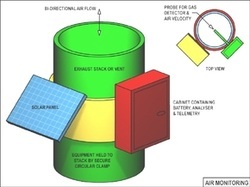 This configuration for StakSentinelTM is suitable for both permanent and mobile installations, and is able to measue airflows in both directions,, such as would be seen on gravity flow sewer vents. This configuration as shown is solar powered, providing flexibility for installing on remote sites and for mobile applications.